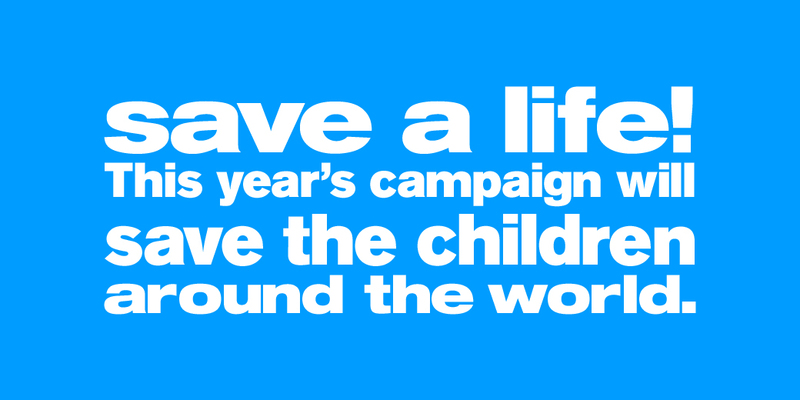 This year’s campaign will give back to save the children around the world with UNICEF and Blessed Homes. Part of the annual profits from each item sold from the Do Not Destroy Store goes directly to the funds listed below. Or you can donate directly here for UNICEF and Blessed Homes. When did you last find a gift that means so much, to so many, for so little? Anti-Malarial Drugs can mean the difference between a full recovery, impaired development and even death for an infected child. Malaria is a constant threat to so many children. Once infected, a child’s best hope is to access a life saving course of anti-malarial drugs within 24 hours. Your meaningful gift provides 360 tablets of Anti-Malarial Drugs, meaning 360 children will have anti-malarial treatment ready when needed. A gift that hurts a little, but helps a lot. A Tetanus Toxoid Vaccination will alleviate one of the greatest threats to a mother and her newborn. In many countries, babies are delivered in challenging and unhygienic circumstances, putting mothers and their newborns at risk for a variety of life-threatening infections. Maternal and neonatal tetanus is among the most common lethal consequences. But maternal and neonatal tetanus deaths can be easily prevented by immunizing mothers with tetanus vaccine. A gift of Tetanus Vaccine gives 400 doses to protect mothers and their babies. One of our most popular gifts, and it’s easy to see why. Measles Vaccines can help prevent this infectious disease from killing more than 600 children every day. Measles causes a debilitating attack on the immune system of a child with the risk of permanent physical and mental disability and claims the lives of hundreds and thousands of children annually. The measles vaccine is a simple and effective solution to stop this disease. Make this your gift of choice to help 100 young lives escape damage and possible death from this disease. This is your gift to give to save lives. Polio Vaccines can prevent infection, children don’t have to suffer, and don’t have to die. It’s as simple as that. Polio is a highly infectious viral disease, mainly affecting young children. It is transmitted through contaminated food and water, and multiplies in the intestine, from where it can invade the nervous system. Many infected people have no symptoms, but can still transmit the infection to others. Give this gift to protect and save 200 children from this highly contagious and incurable viral infection. This little gift has a big impact. Deworming Tablets are incredibly effective at preventing infections from tiny parasitic intestinal worms, a source of misery for so many children. Intestinal worms are rarely fatal, but can go undetected for long periods of time, causing a range of child health problems, some as serious as malnutrition and anemia. In the long-term these conditions can slow a child’s development. They can also really degrade a child’s quality of life. This small and caring gift will deliver protection for 700 children from this pervasive threat. This gift is a real life-saver, yet so simple. Mosquito Nets protect children and their families from deadly malaria. In many parts of the world mosquitos carry malaria, a potentially fatal disease. One mosquito can infect numerous victims, and millions are infected every year. Children are particularly vulnerable. Mosquito Nets, treated with an insecticide, provide a safe area for children and their mothers to sleep under, in addition to repelling other biting insects. Your generous gift will provide 6 nets to protect children and their mothers from malaria. A gift that does so much more than just tell a story. Story books allow children to temporarily escape their circumstances. Many children have no access to libraries, computers, television or even radio. Story books can provide them with entertainment, inspire their imaginations, improve their education and offer a welcome escape from what are often challenging surroundings. Better yet, one book can serve countless children. Your gift will place 8 local-language story books at schools, children’s centers and with children’s families around the world. A special gift that can transform a child’s future. Notebooks and Pencils support children in education and a better future. In developing countries, children overcome numerous challenges to obtain an education. Education is their single best path to break the cycle of poverty and become self-sufficient. A basic necessity for education is paper and a pencil. But the cost of these basic items is often too high for those living in poverty. Your gift will deliver 50 notebooks and 500 pencils to transform the futures of children. Stop the spread of deadly water-borne diseases. Drinking dirty water kills — waterborne diseases like dysentery, cholera and typhoid ravage families, and children are the most vulnerable. These tablets purify deadly, polluted water and make it safe enough for a child to drink. Each one purifies more than a gallon of contaminated water. This impressive gift provides 10,000 tablets to protect hundreds of young lives from preventable illness and tragedy. A miracle for a starving child. Malnutrition contributes to one-third of all preventable child deaths. Therapeutic Food can mean the difference between life and death, providing quick, lifesaving nourishment to a child suffering from acute malnutrition. Known as a “miracle food,” the peanut-based paste is easy-to-ship, ready-to-eat and does not need to be refrigerated. All of this makes it amazingly effective. This powerful present provides 10 malnourished children with lifesaving nutrition for 5 days. Blessed Homes works with children and young people who have become victims of the longstanding conflict in Burma. We want to give these children a hope for a future of freedom and a life where they can dare to dream big. We want to see children who are confident in themselves and dare to take risks, knowing that no matter what might happen, they will always be greatly loved. Our first orphanage opened in 2007, giving a safe home to over 20 children. In the years since then, work has grown to accommodate more than 100 wonderful children supported by over 20 dedicated employees. At the homes, we want each child to grow up in a safe and loving environment with the opportunity for education and play. The youth center will be a nurturing and supportive place where our young adults can take the plunge from childhood at our homes to a more independent adult life. In addition to focusing on education, we want to create jobs for those who are no longer in school. The site for the center is located in Mae Sot, a small town in Thailand with between 60,000 and 100,000 inhabitants.